Is 1 dog-year really equal to 7 human-years? That hasn’t been the case for a long time! With this calculator, you can convert the age of dogs to their human equivalent — and from human-years to dog-years. It is not true that one dog year is equivalent to seven human years. For calculating age, the size and weight of the dog are much more important. In general, a dog is considered old when he or she has reached three-quarters of his or her life expectancy. Life expectancy varies depending on breed and size of the dog, as well as factors like nutrition, lifestyle, and genetic factors. 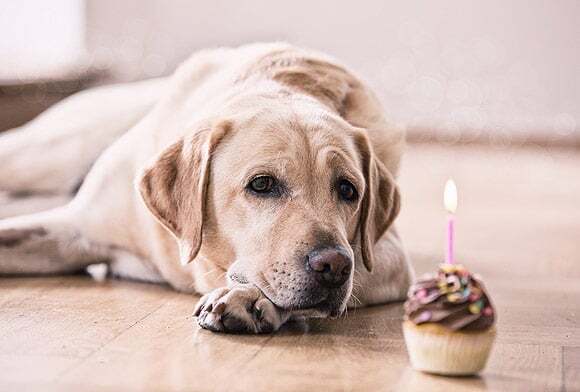 Some indicators of a dog’s old age include (1) a gray snout, (2) lowered performance ability, (3) increased need for rest and sleep, (4) bleary eyes, (5) dental pain or tooth loss, and more. To ensure a long and happy dog life, your pet must have proper nutrition, adequate exercise, and regular check-ups to the vet. Most humans know that dogs age faster than humans. But it is not true that one dog year is equivalent to 7 human years. Because for calculating age, the size and weight of the dog are much more important. In addition, you will receive a number of tips on what makes your dog age especially quickly. Dogs age more quickly than humans. This is why they must be well cared for. It is difficult to determine when the aging process begins. Aging varies from dog to dog and depends on numerous factors. Small dogs live longer than large dogs. Almost fifty percent of all household dogs will live to be older than seven years old. Large breed dogs, such as Great Danes and Bernese Mountain Dogs, are considered “senior citizens” after the age of six. Medium breed dogs and mutts belong to this category after the age of seven. Small breed dogs are not considered old until they are nine years old. Aging starts differently with every dog. The aging process happens sneakily. Male and female dogs have similar life expectancies. Small breed dogs have a higher life expectancy than large breed dogs. Mutts tend to live longer than pure breeds. Neutered dogs live, on average, for a year longer than non-neutered dogs. Dogs of a normal weight live longer than overweight dogs. Dogs who live in a bucolic environment have higher life expectancies than city dogs. How old was the oldest dog in the world? The oldest dog in the world is documented in the Guinness Book of World Records as having been 29 years and 7 months old. He was a terrier named Max. The good news is that we can do a few things to design a comfortable lifestyle for our beloved dogs in the winter of their lives. Those who rest, rust! Regular, well-controlled walks ensure that your dog’s bones, muscles, and joints won’t degrade or get worn out so quickly. Small exercises like slalom or slow backward walking will increase your dog’s agility. And the good thing, it is also healthy for you. Have running shoes in the right shoe size ready, though. Proper nutrition! Diet should be high in high-quality protein and easily digestible fats. All in all, however, the fat percentage should be reduced. Fruits, vegetables, herbs, and greens should be on the menu, as an age-appropriate combination of vitamins and minerals is crucial. Multiple mealtimes instead of one! This way, your dog will be better able to digest food. Old dogs are creatures of habit! Avoid changes to the daily routine. Go to the vet for a check-up at least once a year, so that age-specific illnesses can be identified and treated in a timely manner. Take care of your dog! Brush your dog regularly and look out for knots (indications of tumors!) in the skin. Should these appear, show them to your vet immediately. Don’t forget dental care with dried tendons, hard bones and cattle skin! Toothaches will lead your dog to eat less and become malnourished. Choose a soft place to sleep with a pleasant temperature. Changes to this should be avoided at all costs. Food foraging games are an excellent way to bring variety to everyday life. Take dog toys with you on your walks. They’ll make them more fun and keep your dog’s mind in good shape. Also, you will stay in shape. 3 When is a dog considered old? 5 How old was the oldest dog in the world? 6 How long do dogs live?